Well, that’s what the gilets jaunes have been protesting about in France these past few months. And that is why President Emmanuel Macron instigated the Great National Debate. He’s listened to the people and now he has to come up with the plat du jour. The world is seething with populist anger over ever-widening income gaps between the uber-rich elite and everyone else, and France isn’t an exception. For a country whose republic foundations are meant to focus on social equality, it lags behind other big players. According to the World Bank it has less economic equality (egalite) than the US, Canada, UK. Its inequalities are apparent between urban and rural communities, full-time and part-time employees, education and what is perceived as the divine right of state pension – something that the younger generations are being excluded from. So social unrest is not an unexpected outcome. 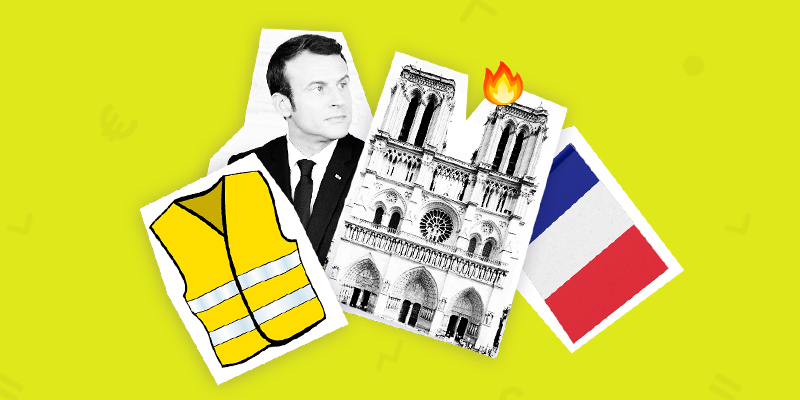 To defuse tensions on the streets, Macron set up the Great National Debate, whereby he toured town halls to listen to people’s issues and collected feedback from a ‘book of grievances’. As expected, the consensus centres around three key issues: taxation, public services and climate change. President Macron was to give his response to the republic on Monday evening. However, the upsetting site of Notre Dame going up in flames meant he had to postpone his television broadcast. Could the fire be a foreboding of how he is going to solve the people’s concerns and the stale state of the French economy? His problem is that France is severely constrained in its ability to solve matters alone as it’s tied to the Euro currency – running further deficits to improve social spending is a Non! He has already raised taxes from the middle classes, leaving him, realistically, with little option but to tax his buddy elite. As an ex investment banker, Macron may find it hard to swallow that particular oyster. Never ask for whom the bell (of Notre Dame) tolls; it toll for thee, France!